The Power Fighter Cool-X glove is listed by RDX as one of their original cow hide leather boxing gloves and is suitable for any variation of boxing or kickboxing, in my case Muay Thai. All of RDX’s Cool-X gloves feature ventilated mesh palms for breathability. As they’re not Muay Thai specific gloves they come with an attached thumb, which somewhat limits the flexibility of the hand when clinching, but this didn’t make a noticeable difference to me when using them. I reviewed a 10oz pair for use on pads, but they come in 10, 12, 14 and 16oz variants, and having been hit in the face numerous times by another fighter’s 16oz pair I can vouch for how padded they are! The weight is naturally mostly round the knuckles and back of the hand, but the gloves feel well balanced with a broad wrist strap offering greats support. The colour range on offer is fairly limited, take your pick from red, white or blue, all of which have a graphic ‘distressed’ look. I really like this as it gives the gloves an old school feel, particularly on the white pair I got my hands on, but I know many people who prefer a clean cut look to their gear who might consider this a major drawback. 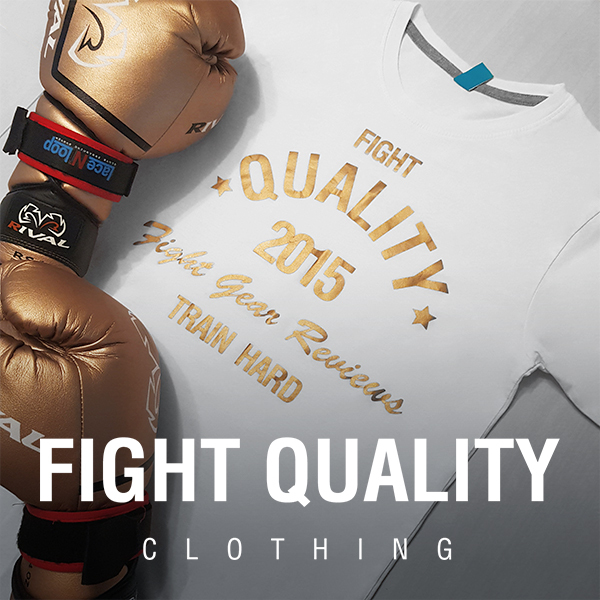 The gold graphics includes the standard RDX logo and ‘Power Fighter’ in a handwritten font over the knuckles, and then a stylised ‘R’ printed over the back of the hand. The glove weight is handily printed on the grip bar. The wrist strap features the same RDX logo in a solid print and the brands tagline ‘beyond fighting’. Overall I really like the appearance of this glove, and love the modern-yet-authentic looking visuals. The outside of this glove is high quality cow hide leather, and the inner lining is all a synthetic polyester with an almost satin feel that makes these gloves very comfortable. As mentioned earlier, the 16oz always seem very padded when on the receiving end of punches, but I was also surprised by how padded the 10oz’s are. With hand wraps I can hit pads for a full session and don’t get any discomfort from throwing even the hardest punches, plus I’ve never had any aches or pains the next day after using them. Obviously the combination of Shell-Shock gel technology and Max-Shock foam that RDX uses across the hands and wrist works very well. The Cool-X tech mesh covered palm isn’t exactly air conditioning, but there is a noticeable difference between these and my regular sparring gloves which have a full leather palm instead. One feature I do really like about this product is the traceability; there is a label inside the Velcro wrist strap that tells you the machine it was made on, this pair came off machine number 141. As mentioned already, the gloves are machine made, which can mean rushed production that leads to a lower quality, however RDX did a good job on these. The leather is double stitched across the palm, wrist and round the thumb and single stitched around the rest of the joints. There is some stretching around the curve of the fingers where the material is folded to create the bend, but the folds are all even and very neatly done and there’s no evidence of the stitching being weak anywhere. I do often think that the thumb is position is slightly too far forwards and I often find myself connecting with the tip of my thumbs as well as my knuckles, which is another drawback, but does make it easier to clinch or catch kicks with these gloves. The wrist strap is nice and broad offering sturdiness when you connect as well as good padding when using your guard. The hand compartment felt quite tight when I first got the gloves, especially with wraps on, but it loosened up nicely after a few sessions and now they’re broken in they fit brilliantly. The wide Velcro wrist allows for a nice tight closure offering plenty of support, and I’ve never had issues with the gloves loosening off during a round. Having said this they’re still very easy to take on and off in between rounds, it’s not difficult to get a grip on the strap with one glove in order to take the other off. Size wise the gloves are fairly standard compared to others of the same weight, with fairly dense padding round the knuckles. In my opinion these are great all-rounder gloves, 14 and 16oz’s will make suitable sparring gloves and 10 and 12oz’s would be better suited to pads. I’d highly recommend the heavier weights to any beginners looking for a good starting pair of gloves for both pads and sparring, and the lighter weights to more experienced fighters looking to get a pair specifically for pad work. If looking purely for sparring gloves however, I feel that there are better brands available. These gloves are sold by RDX for around the £30 mark. This puts these gloves well in an affordable range for beginners or people looking for a second pair of gloves. Having used these regularly for the past few months I think this represents great value for money, considering the quality of these gloves. Please note: RDX Power Fighter Cool-X Boxing Gloves range has now been replaced, but the full range of gloves can be found at the link below. Feel free to add your own thoughts on these in the comments below.